Right on top of the letter sent by all twelve state-based exchange heads to the Senate HELP Committee comes a similar open letter signed by eight sitting Governors to all four Congressional leaders (McConnell/Ryan & Schumer/Pelosi). It includes 5 Democratic Governors, but also 2 Republicans and one Independent. The effort was spearheaded by Republican John "Yeah, he's definitely primarying Trump in 2020" Kasich of Ohio and Democrat John Hickenlooper of Colorado, but also includes Brian Sandoval (GOP, NV); Tom Wolf (Dem, PA); Bill Walker (Indy, AK); Terry McAuliffe (Dem, VA); John Bel Edwards (Dem, LA); and Steve Bullock (Dem, MT). Immediate federal action to stabilize markets. No biggie. Healthcare coverage funding for 8.9 million children is at risk of being cut off next month, that's all. State officials increasingly worry that this year’s turbulent health-care politics could threaten funding for the Children’s Health Insurance Program, a popular initiative that usually wins broad bipartisan support. Federal funding for CHIP is set to end Sept. 30. The federal-state program provides health coverage to more than eight million low-income, uninsured children whose family incomes are too high to qualify for Medicaid. Note: It's actually more than that: 8.4 million children as of 2015, and 8.9 million in 2016. Read more about No biggie. Healthcare coverage funding for 8.9 million children is at risk of being cut off next month, that's all. Gov. Matt Mead lamented the $100 million that Wyoming left on the table by choosing not to expand Medicaid, and he expressed concern for the state’s hospitals while discussing health care with the Star-Tribune recently. Mead echoed some of the fears that many Wyoming hospital officials have expressed for months: that congressional proposals to overhaul the health care system may have negative effects on facilities here and that the state has suffered because it chose not to allow more people to qualify for Medicaid. “The idea that we did not accept Medicaid expansion and things are going to be good just hasn’t turned out,” he said. Thank you and members of the Senate Health Education Labor and Pensions Committee for your commitment to hold September hearings on actions that Congress should take to stabilize and strengthen the individual health insurance market. The State Health Exchange Leadership Network, an association of state leaders dedicated to the implementation and operation of the state-based health insurance marketplaces, appreciates this opportunity to submit testimony. Health and Human Services Secretary Tom Price, MD, declared a public health emergency in Texas on Saturday as Hurricane Harvey was pounding the state's coast. Harvey made landfall late Friday night with winds topping 130 mph. Forecasts called for the storm to hover over the state for 5 days or more, possibly drenching some areas with as much as 50 inches of rain. Hundreds of thousands were without power and the National Weather Service said parts of Texas could be "uninhabitable for weeks or months." "Many Medicare beneficiaries have been evacuated to neighboring communities where receiving hospitals and nursing homes may have no health care records, information on current health status or even verification of the person's status as a Medicare beneficiary. Due to the emergency declaration and other actions taken by HHS, CMS is able to waive certain documentation requirements to help ensure facilities can deliver care," an HHS statement read. FLASHBACK: Here's Bernie's PRIOR "Medicare for All" plan. According to several sources, Bernie Sanders plans on releasing a new "Medicare for All" plan in the next week or two. In light of this, I thought it might be a good idea to remember his last such plan, introduced back on January 18, 2016 in the midst of his heated primary battle with Hillary Clinton. If you visit BernieSanders.com and click on the "Issues" tab today, you can still find his official 2016 campaign "Medicare for All" plan, without a single word changed. Read more about FLASHBACK: Here's Bernie's PRIOR "Medicare for All" plan. Note: This entry is in response to Kimberly Leonard's article at the Washington Examiner in which she interviews unsubsidized individual market enrollees. Amidst all the discussion and debate about how to fix/improve/strengthen/expand the Affordable Care Act, one thing I've written about as much as anyone else (and far more than many others) is people enrolled in the unsubsidized individual market. To recap: Around 18 million people are enrolled in individual market policies, of which around half (9 million) receive tax credits to help cover a chunk of the premiums. Of those, around 7 million also receive CSR assistance to help cover deductibles and co-pays. The amount/portion of their expenses which are covered varies from high to low based on a sliding income scale, and it's frankly too skimpy at the upper end of that range, but at least these folks receive some assistance. Read more about One Of These Things is Not Like the Others. File this one under "Be Careful What You Wish For". Just a couple of days ago I reported that the New York Dept. of Financial Services had issued their approved 2018 rate changes for the 15 insurance carriers participating in the state's individual and small group markets...and, in some welcome news, they whittled down the rate increases by a bit, from 17.7% on average to 14.5% on average in the individual market, and from 11.7% to 9.3% in the small group market. New York State’s biggest hospital system plans to stop selling Obamacare plans, blaming a costly plank of the law and uncertain prospects for a fix amid a wider Washington brawl over health care. Hey Michigan Residents! Do you live in the Clinton Township area? Hey Michigan Residents! Do you live in the Marquette area? Quick recap: As of 2013, the pre-ACA individual market consisted of around 10.7 million people. The vast majority of the policies these folks were enrolled in were not ACA-compliant for one reason or another, including not covering one or more of the 10 Essential Health Benefits (EHBs) required by the ACA, having annual/lifetime caps on benefits or any number of other reasons. Under ACA regulations, non-compliant policies which people were enrolled in prior to March 2010 (when President Obama signed the ACA into law) were grandfathered in...that is, insurance carriers could continue to offer them to existing enrollees for as long as they wanted to, and existing enrollees could stay on them for as long as they wished, but they couldn't be offered to anyone else, and once a current enrollee dropped out of a grandfathered plan they aren't allowed to rejoin it later on. The number of "grandfathered" enrollees has gradually declined since 2013, of course, as people either move to other coverage, die off (hey, it happens) or the carriers decide to discontinue the policies altogether. OK, perhaps this is just me being paranoid, but then again, given the #TrumpRussia/Hacking brouhaha, perhaps not. Like most website owners, now and then I like to check my website analytics to see how the site is doing traffic-wise. Every now and then I'll poke through the various demographics of site visitors. Once in a blue moon I'll even check which country people are visiting from. Given the nature of this site, obviously the vast majority of the traffic comes from the United States; after that, most visitors typically come from Canada, the United Kingdom or France, none of which is particularly surprising. However, I noticed something interesting today, and decided to go back to prior years to check on something...and sure enough, guess what? Read more about From Russia with Love? IRONY: Trump/GOP CSR sabotage could cancel out their OTHER sabotage. As I noted earlier today, there’s a gazillion ways the Trump Administration could sabotage (and in some cases, is already sabotaging) the 2018 Open Enrollment period this fall, doing everything in their power to dampen, obstruct and otherwise minimize the number of people who actually enroll in a healthcare policy via the federal ACA exchanges. However, as I've noted before (and as the CBO confirmed last week), due to the confusing, inside out way in which the APTC and CSR subsidy formulas happen to work, there's also the potential for one of the most pressing sabotage schemes by Trump and the GOP to backfire completely, leading to the potential for a significant increase in ACA exchange enrollment. Read more about IRONY: Trump/GOP CSR sabotage could cancel out their OTHER sabotage. Just how much will individual market policies cost next year? For all the fuss and bother about how much premiums are expected to go up on a percentage basis next year, using percentages can be misleading, since the lower the premium is to begin with, the more dramatic a percentage increase is going to seem relative to where it started. With that in mind, I've decided to mush together two recent projects of mine: First, my debunking/correction of the May ASPE report which disingenuously claimed that individual market premiums had "increased by 105% since 2013 due to the ACA"; second, my 2018 Rate Hike Project. As I noted when I debunked/corrected the ASPE report, not only did it turn out to be somewhat lower when all 50 states were included (84%, not 105%), but the ASPE report completely ignores both the financial assistance provided to roughly half the market and, just as importantly, blows off the apples to oranges mismatch between the numbers, because only a handful of states had guaranteed issue laws in 2013, and only one (NY) had a community rating law. Having said that, as long as you keep those caveats in mind, the (corrected) ASPE report does provide a good baseline for figuring out what the 2018 premiums are likely to be. By merging the spreadsheets for these projects together, I've come up with a rough idea of what I expect to see in terms of unsubsidized, full-price premiums for individual ACA policies this November. I'm using a median instead of a weighted average this time around because I expect high variables in terms of the number of people who enroll in each state compared to 2017 (unfortunately, I still don't have 2018 data for several states, and I don't have the 2017 dollar average for DC to compare against). I've ordered the states from lowest to highest based on the assumption that CSR reimbursements aren't made next year ("full sabotage effect"). The blue sections are my best estimates for each state assuming CSRs are paid; the yellow sections represent how much of the average premiums are due to "CSR padding" by the carriers. Read more about Just how much will individual market policies cost next year? The number of people uninsured would be slightly higher in 2018 but slightly lower starting in 2020. In general, their projections on the impact on premiums (unsubsidized and subsidized) is similar to what I, the Kaiser Family Foundation, Oliver Wyman and others have been saying all along: Around 20 percentage point increases across all Silver plans (which would be the equivalent of around 14-15% if spread out across all plans on & off the exchanges. Read more about So, did I miss anything? Hey Michigan Residents! Do you live in Michigan's 1st Congressional District? Are you sick of Jack Bergman (MI-01) refusing to even talk to you about their "replacement" healthcare bill, which would tear away healthcare coverage for millions of Americans and hurt the coverage of countless millions more? Tomorrow afternoon, CBO expects to release a report, which is being prepared with the staff of the Joint Committee on Taxation, about the effects of terminating payments for cost-sharing reductions. The analysis will include effects on the federal budget, health insurance coverage, market stability, and premiums. Unfortunately, I'm not going to be in a position to write anything up about the CBO report, as I'm going on a long-overdue mini-vacation to visit Mackinac Island for a few days. I'm sure I'll be chiming in via Twitter when possible, but my wife will kill me if I try to write a full blog post, so that'll be about it. Trump's CSR sabotage will mostly fail, but he's still trying to TKO OE5. Some carriers, tragically, have already thrown their hands up in the air and decided to wash their hands of the whole thing by choosing either #1 or 2 above. This includes Humana, Aetna, Wellmark and, most recently, Anthem, which is drastically scaling back their 2018 individual market participation levels. Read more about Trump's CSR sabotage will mostly fail, but he's still trying to TKO OE5. Corrections to CSR factor impact, etc. As noted the other day, now that I've compiled the initial 2018 rate filing requests for 46 states + DC (the remaining 4 states aren't public yet), it's time to go back to the earlier states I analyzed and see whether there's been any updates/corrections to my original estimates. I started running the numbers back in early May, and a lot has changed since then, with carriers dropping out of the exchanges, expanding to fill the gaps or simply refiling with revised pricing requests. Question: What changes will be made to the risk adjustment methodology to account for recent rating practices that assume issuers of silver-level QHPs facing increased liability for enrollees in cost-sharing reduction plan variations? UnitedHealthcare had previously announced they were dropping out of Virginia, but I didn't have an enrollee number for them, and Aetna had also just announced their withdrawl from the state. I hadn't yet finalized my "CSR/Mandate Penalty" factor layout yet; at the time I assumed the 30.6% weighted average requested assumed full CSR/mandate sabotage and reduced that number by 17 points based on the Kaiser Family Foundation's "19% national average CSR rate hike" estimate analysis, which estimated the CSR impact at 17 points for Virginia. CONFIRMED: ~2/3 of requested 2018 individual market rate increases due SPECIFICALLY to Trump/GOP sabotage. Regular readers know that I've spent the past 4 months painstakingly tracking and analyzing the 2018 individual market rate filings for pretty much every insurance carrier in every state across the country. I've completed this process for 46 states + DC. I've confirmed (well, really, Louise Norris confirmed for me) that the filing data for the four missing states--Kansas, Missouri, Nevada and Utah--won't be made available publicly for another couple of weeks, which is irritating...but those four states combined only make up about 5% of the total population anyway; unless their average rate increase requests are significantly higher (or lower) than the average of the rest of the states, they aren't gonna move the needle up or down by more than a tenth of a point or so. Read more about CONFIRMED: ~2/3 of requested 2018 individual market rate increases due SPECIFICALLY to Trump/GOP sabotage. I had already posted a partial look at the New Jersey rate hike situation a couple of weeks ago with a video in which Topher Spiro of the Center for American Progress interviewed NJ Congressman Frank Pallone about the situation. Since his comments weren't official and only referred to Horizon Blue Cross, I didn't make it an official part of the Rate Hike spreadsheet, but now I've managed to plug in the remaining carriers and here's how it looks. As expected, with Horizon holding a commanding 70% market share, the statewide average is around 8.5% if CSR payments are made and the mandate is enforced versus 21.6% if CSR payments aren't made and the mandate isn't enforced. Also, check out Horizon's cover letter explaining the rate hike...they're not screwing around with who to pin the blame on. Last year, Blue Cross Blue Shield of Oklahoma, as the only carrier participating on the ACA exchange in the state, jacked up their premiums by a jaw-dropping 76%. This resulted in the highest statewide average rate hike in the country of 71% overall. Well, that certainly seems to have done the trick: This year BCBSOK (still the only on-exchange player and holding over 99% of the market anyway) is requesting a (relatively) modest 8.3% average rate increase...and their filing specifically calls out both the CSR and mandate enforcement factors as being major reasons. Assuming the Kaiser Family Foundation's estimates are accurate, that means that if the CSR payments were guaranteed for 2018, BCBSOK should actually be lowering their rates slightly, to the tune of around 2.4%. Adding in the steep hikes from off-exchange only CommunityCare (which only has 1,400 enrollees) brings the averages in at a 1.9% rate drop if CSRs are paid, and an 8.7% increase if they aren't. I admit to being a bit confused about the distinction between BCBSSC and BlueChoice HealthPlan, which is also a BCBS carrier...I'm guessing one is for HMOs, the other for PPOs or something. In any event, BlueChoice plans appear to only be available off-exchange, and are thus not subject to the CSR issue. BCBSSC is, however, and the Kaiser Family Foundation estimates that their Silver plans would have to go up 23% if CSR payments are cut off. 87%% of SC exchange enrollees are on Silver plans, so that should be roughly 20.2% across all policies. If CSR payments are made, South Carolina is looking at around a 13.2% average rate hikes; if they aren't, it's an uglier 32.5%. UPDATE: 2018 Rate Hikes: FLORIDA! We're heading into the home stretch now, with the only remaining "supersize" state, FLORIDA. FL has the largest exchange-based individual market enrollment, and the 2nd largest total individual market enrollment of any state in the country, surpassing California for a variety of local economic/demographic reasons. The Kaiser Family Foundation estimates that FL carriers would have to add about 25% to their Silver plan premiums in order to make up for CSR reimbursements if Trump pulls the plug and/or Congress doesn't formally appropriate them. Since 80% of FL exchange enrollees are on Silver plans, that translates to roughly a 20% additional "Trump Tax" for the CSR factor alone. Note that while none of the carriers mention the CSR issue (meaning they all assume the payments will be made), Molina does call out the individual mandate enforcement issues as being part of their 37.5% rate increase request. Unfortunately, they don't put a hard number on this. Read more about UPDATE: 2018 Rate Hikes: FLORIDA! Interestingly, while Medica's rate filing letter clearly states that the 16.9% request assumes CSR payments will be made and the mandate will be enforced, they also list "unprecedented uncertainty/risk inherent in the marketplace" as one of the key drivers of the increase. The Kaiser Family Foundation estimates the CSR issue as adding around 15% to NE Silver plans, which translates into roughly a 10% additional increase if spread across all polices, or 26.9% overall. There's only two carriers participating in Mississippi's individual market next year (plus Freedom Life, which once again is just a shell company here). They're asking for 16.1% average rate hikes, and since there's no mention in any of the filings about CSR payments not being made or the mandate not being enforced, I'm assuming that increase doesn't account for those factors. The Kaiser Family Foundation estimates MS carriers would have to jack up Silver plans by a whopping 27% to cover lost CSR reimbursements. 87% of MS exchange enrollees receive CSR help, so that amounts to a stunning 23.5% average rate hike if spread across all individual policies. As a result, assuming they aren't made, I estimate Mississippi's average rate increase would be an ugly 39.6%. Massachusetts has one of the stablest statewide insurance markets, no doubt in large part due to their having instituted the precursor to the ACA, "RomneyCare", 4 years earlier. Massachusetts also merged their small business and individual market risk pools, which helps stabilize things. As a result, they have a high number of carriers participating in their ACA exchange and are among the few states with single-digit average rate hikes...assuming CSR payments are forthcoming and the individual mandate is properly enforced. Assuming CSR payments aren't made, I used the Kaiser Family Foundation's 19% average estimate for Silver plan hikes due to the CSR factor. Since a whopping 92% of MA's exchange enrollees chose Silver plans (it looks like MA's unique "ConnectorCare" plans are considered Silver as well), that means an average CSR factor of around 17.5 points across the entire individual market. I SCREWED UP ROYALLY. Instead of making a few simple corrections, I've chosen to completely rewrite this entry. My apologies for the error; full explanation and corrected data analysis below. Longtime readers know that in addition to the core function of this site (it's right there in the title above), I'm also obsessed with tracking and breaking down the off-exchange individual market. This is easier said than done, because every state except for DC (which isn't actually a state) allows people to continue to purchase individual market policies directly through the insurance carriers...and unlike exchange-based enrollment, off-exchange enrollments don't usually have to be reported publicly. Some states require them to do so as part of internal state regulations, but they're usually a pain to get ahold of and other states protect the data as trade secrets, etc. Hawaii only has two carriers on the individual market (and in fact doesn't even have much of an individual market due to a state law mandating that nearly every business provide coverage anyway). HMSA's filing letter is very specific about calling out both the CSR and mandate enforcement sabotage factors as being part of their request. Kaiser doesn't really mention either issue at all, and the only CSR reference in the filing seemed to assume it would be paid, so I have one in each category. Kaiser Family Foundation assumes a 21% Silver CSR rate hike, and 71% of Hawaii's exchange enrollees are on Silver plans, so that amounts to roughly a 15% overall CSR factor. Whew! OK, Texas was a bear for obvious reasons...13 different carriers (well, 12 really...Centene is new to their market). Several more are dropping out (Aetna, Allegian, Cigna, Humana, Memorial Hermann and Prominence), but suposedly theyonly have around 64,000 enrollees in TX combined. 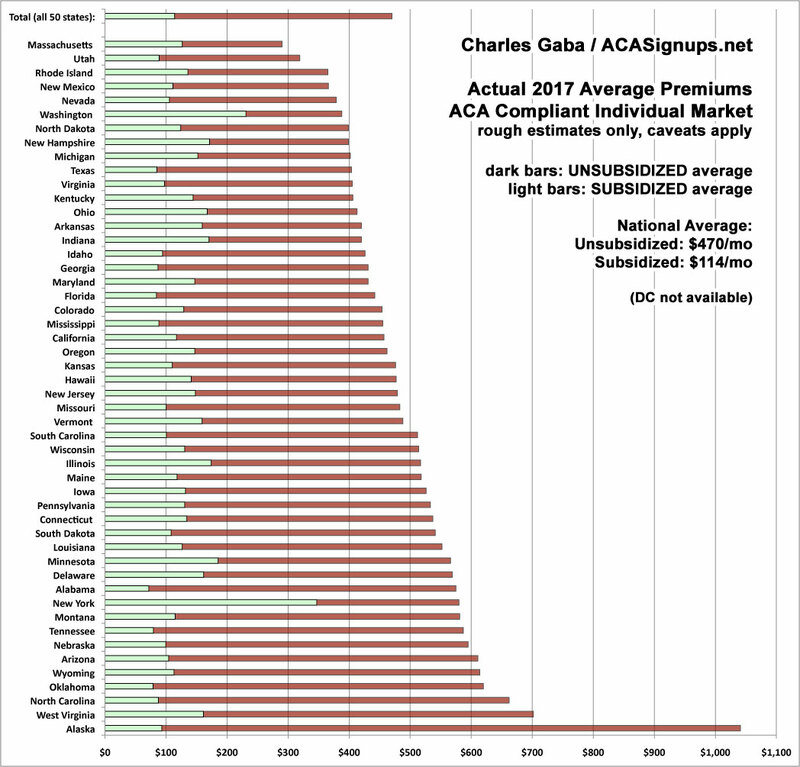 Texas's total individual market is actually closer to 1.6 million, so I'm obvoiusly missing a big chunk of enrollees below (and before my regular commenters say it: Yes, I'm sure the off-exchange TX indy market has shrunk this year, but I find it hard to believe it's shrunk by over 60% already). Anyway, I've managed to plug in one hard request percent for each carrier--the FULL Trump Tax for 3 of them, the NO/PARTIAL Trump Tax for most. In Vista's case, they're off-exchange only so the CSR issue isn't a factor anyway. Unfortunately, I can't seem to find the enrollment number for Community Health Choice, so I don't know what their share of the market is, which could make a big difference if they have high enrollment. I've plugged in a flat 100,000 enrollees for the moment, but will change that if I'm able to track the actual number down. Read more about 2018 Rate Hikes: TEXAS! 2018 Rate Hikes: Arkansas: 10% without CSR sabotage, 18% with. The states filings are piling up quickly...Arkansas is pretty straightforward. Interestingly, four of the five carriers seem to be assuming that CSR payments will be made, and have submitted their rate filings accordingly; the fifth (and largest), USAble Mutual (aka Blue Cross Blue Shield of AR) is the only one to break it out specifically. In order to estimate the CSR factor for the other 4 carriers, I'm assuming 2/3 of Kaiser's 15% Silver plan bump estimate, or around 10 percentage points. That brings things in at around 10% even without CSR sabotage or nearly 18% with the CSR factor. One other important thing to keep in mind regarding Arkansas: Their total individual market, including grandfathered and transitional plans, is something like 430,000 but they only have around 70,000 officially enrolled in ACA exchange policies. The main reason for this is that they have another 320,000 people enrolled in exchange policies via their "Private Medicaid Option"...which is Arkansas' version of ACA Medicaid expansion. For some reason, those folks aren't counted as ACA exchange enrollees even though it's my understanding that the only distinction between them and the 70K official enrollees is where the payments/subsidies come from. Read more about 2018 Rate Hikes: Arkansas: 10% without CSR sabotage, 18% with. "Lord knows you just don't mess around with CSR." 48 hours ago I posted this analysis/explainer of the "Silver Switcharoo", the goofy, bass-ackwards workaround which insurance carriers and state regulators could (if necessary) use to resolve Donald Trump's impending threat to pull the plug on Cost Sharing Reduction subsidy reimbursement payments. Congressional Republicans moved on Tuesday to defuse President Trump’s threat to cut off critical payments to health insurance companies, maneuvering around the president toward bipartisan legislation to shore up insurance markets under the Affordable Care Act. Read more about "Lord knows you just don't mess around with CSR." The Affordable Care Act insurer in 13 of Arizona's 15 counties plans to raise average rates across all plans a moderate 7.2 percent next year. But Blue Cross Blue Shield of Arizona officials said the rate increases would be flat if President Donald Trump's administration did not plan to eliminate a key Affordable Care Act funding source. Trump suggested in a weekend tweet that " ... bailouts for insurance companies and bailouts for members of Congress will end very soon" unless Congress acts quickly on a new health bill. The competitive market allows consumers to limit the rate change to 3.3 percent if they switch to the lowest-cost plan in the same metal tier. It feels almost silly for me to spend so much time crunching the average 2018 rate hike numbers at this point. Between the (supposedly failed?) GOP repeal effort and Donald Trump's ongoing sabotage efforts--including what could be him officially pulling the plug on CSR reimbursements as early as sometime today--it's probably a bit of a futile effort. Besides, a dozen other wonks/analyses have already confirmed what the Kaiser Family Foundation projected months ago and which I've been proving on a state-by-state basis for months now: The CSR threat is causing average rate hikes of around 20 points on average, and the threats to individual mandate enforcement are tacking on another 4-5 points on top of that, beyond the ~10 points which rates would normally be increasing on average.